This Is Your Captain Speaking: Why Is That Baby Crying? One of the hazards of modern air travel is the infant. Along with the toddler, the infant presents a very real and present danger to one's survival on a modern airliner. Being anywhere within audible distance of either of these two noise emitters can turn any normally tedious exercise in being crammed into a 28 inch pitch coach seat into a Chinese water torture-like experience. Luckily, there are measures that can be taken to mitigate this common assault on your sanity. Flying first class is a proven strategy to avoid very young flyers but this has its own drawback of being a little spendy. And of course there can be upscale flyers who might bring junior along with them to also fly in first class defeating the technique entirely. In fact since the well heeled typically don't discipline their children at all, a toddler in first class will be particularly insufferable. As little Jared kicks your $1500 seat for hours on end you might hear mom say "stop kicking that nice man's seat" perhaps once during the flight. And if kicking your seat occupies Jared's attention so mommy can enjoy her cabernet, well then that's it. And don't even think about asking a flight attendant to intervene as they'd rather break up a wild dingo fight than counsel a mother on child rearing techniques. Another good toddler or infant mitigation strategy is the use of noise cancelling headphones. Modern headphones are quite good at removing almost all ambient cabin sound to include screaming infants. This is especially true if one is also listening to an iPod recording of death metal or klezmer music. Just remember to carry enough batteries with you to keep your electronic defenses powered up for the duration of the flight. The noise cancelling headset will not help though in the case of toddler seat kick or that of an infant offering you a taste of a soggy animal cracker over her mother's shoulder. For that you need to practice a pre-emptive strategy of defensive seat selection. For many airlines, seat selection is made when booking the flight on the internet. If the flight isn't very full and you have the available seating chart, selecting a seat in front of a vacant row might mean you won't have anyone directly behind you though honestly, airlines are so full these days that this isn't very realistic. In this case, one must be proactive and immediately request to be reseated should a toddler wind up behind you. Claiming something like a needed proximity to the lav due to irritable bowel syndrome could be a viable game plan. Flight attendants generally recoil at any possibility of bodily fluid release so that helps. If you find yourself flying on an airline that doesn't assign seats such as Southwest (our favorite airline), be sure to choose a row of seats either very near the front or the overwing where children are prohibited if any are available. Family boarding is generally after the first group and travelling families will be looking for an unoccupied row. At that stage of boarding, this will be just behind the over wing exit. Avoid this area. If you must sit in this area, choose a row which already has someone in the row just behind. It also helps to choose a row with at least one other person already seated thereby foreclosing the possibility of a single mom with infant joining you. Should the worst happen and a toddler takes up residence behind you, do not panic. Without making eye contact with the family, simply get up and move to a different seat expeditiously. You need not even move your bag from the overhead if you've placed it there. Move aft and grab a middle seat if you must knowing that a middle seat sans kicking will always trump screaming and/or kicking or projectile animal crackers. 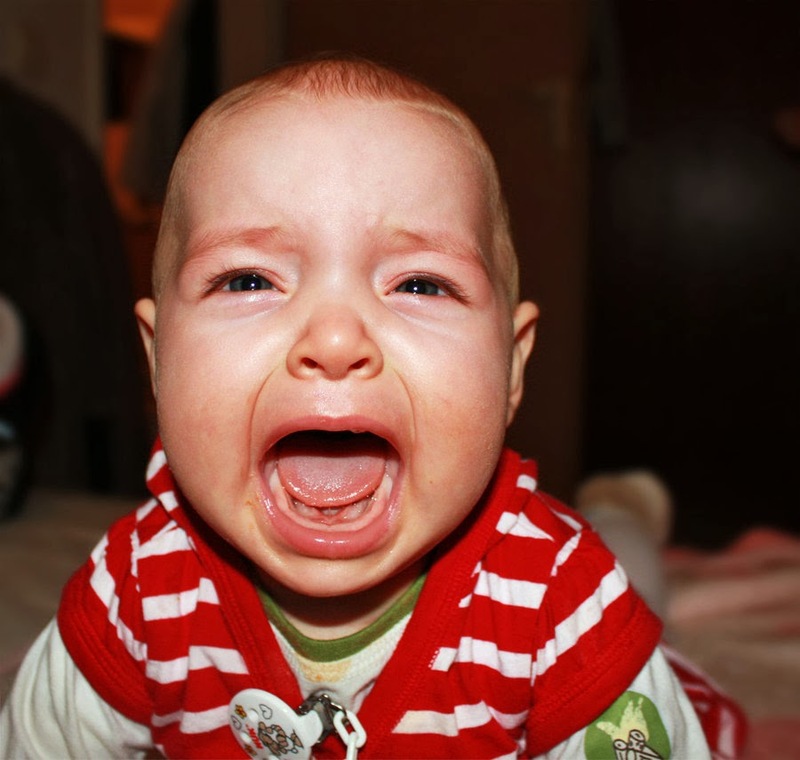 Oh by the way, the reason babies tend to cry on descent? They can't clear their ears as the cabin pressure increases from about 8000 ft pressure altitude while at cruise down to airport elevation. Air is trying to enter into their inner ears and sinuses but can't easily do so without help. This causes pain, but the crying actually helps their ears clear. The reason it mostly happens on descent and not during climb is because air escapes easily from ears and sinuses on climb with little help needed. It's the same reason flying with a cold may hurt. Now you know. Lastly, if you happen to be the person travelling with an infant or toddler we have but one word of advice: Benadryl. They sleep and are clear. Win-win.